Sebuuh negah is [ deleted ] in his pants knowing time of reckoning is fast approaching. Weyzero debrexion is ready to surrender this coming monday. Digital hamema will be added to the unemployed statistics of tigray kilil. Enderta vs tplf is happening right now. Endertas are ready to punish sebuh neegah for claiming "Enderta abi himbhasha ember abi seb yeblomen"
Weyzero debrexion recently labelled people from Enderta "banda" now endertans are up in arms ready to make weyzero debrexion pay. They should not be led by emotions,they should follow the strategies written by the two friends from Germany,beright future. Free Enderta ! Free Enderta ! Adwa should not prevent Enderta from looking after its own economic and cultural interest. In the latest ploy to maintain grip on power, the Ethiopian government has arrested 60 top officials from various agencies. We must all ask why these token arrests are being made now – months after selective arrests, firings and persecutions of Tigreans? Here’s the thing. Clearly, Team Lemma and their foreign masters’ original plan of targeting TPLF leaders and the Tigray’s political class to consolidate power and remake Ethiopia according to the instructions of foreign puppeteers has not worked. TPLF refused to hand over leaders like Getachew Assefa and others arguing that the campaign was nothing more than a selective and politically motivated witch hunt specifically designed to eventually subdue and subjugate the people of Tigray as a whole. Since the plan of eliminating TPLF and the Tigrean elite has not worked, they are now scheming to entrap Tigray and its leaders once more. Months after the arrests of General Kinfe (Head of METEC) and other prominent Tigreans like Essayas Dagnew (former COO of Ethio Telecom) and Biniam Tewolde (former INSA Deputy Director), Team Lemma appears to have just adopted a new strategy hoping to politically corner TPLF and the government of Tigray, to force them to hand over former top EPRDF officials currently residing in Tigray. Presumably, if the Tigray government refuses, they could face political consequences. This is necessary because it’s perceived that these old guards have made it impossible to sell the country to the highest foreign bidders and that the Team Lemma is seen by everyone as simply weak. They therefore want to flex their muscles to prove to their masters that they still have the upper hand. 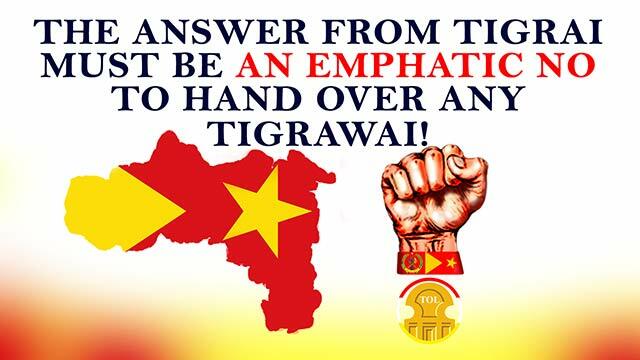 The answer from Tigray must be an emphatic NO. Nobody should buy these disingenuous maneuvers ahead of Monday’s EPRDF emergency meeting as genuine effort to target corruption. They are not. At this point, the government will have to issue arrest warrants against current government officials involved in crimes against humanity that has been visited against Tigreans nationals over the last 12 months before Tigray is obligated to even responds to such demand. Government officials are directly responsible for the massacre and displacements of thousands of Tigreans across Ethiopia today. Using similar inciting language as the Rwandan genocide – e.g. daytime hyenas, tsegure lewot as well as authorizing documentaries targeting ‘Tigrean speakers’ – they have directly caused the targeted killings, lootings and displacements of Tigreans. Of course, there have been horrific killings and displacements orchestrated against non-Tigreans across the country. The deaths and displacements of the Gedo people, the displacements of Amhara and Tigreans from various sections of Ethiopia accused of being ‘new settlers’, the displacement of Oromos from the Somali and Somalis from the Oromo regions and the debacle in Legetafu and Sululta against innocent citizens are but a few examples of what non-Tigreans have faced across the country. However, what makes the plight of Tigreans across Ethiopia very different is the fact that the massacres and displacements were actually incited by those in Federal government. No other ethnic group has been singled out by the government in this manner. Under plan B, the ruling clique within the federal government and EPRDF could very well demand the immediate extradition of former top EPRDF officials residing in Tigray. But, the answer from Tigray must be a resounding no. The attorney general must first issue warrants for the arrest of those within the current federal government that have incited the public and directly caused the massacre, looting and displacement of Tigreans. This must be one among many preconditions to any discussions about extraditions. In addition, TPLF officials in Tigray must increase Tigray’s security alert level to HIGH as some of their leaders head into Monday’s EFPRDF meeting. This is a game of chess. Team Lemma and its foreign masters are attempting to roll out their Plan B. Tigray must be able to see several steps ahead to inform our decisions today. Hamasenay midre Lootineshes, kkkkkk you all came out from your closets at once, yes Enderta used to enslave you for centuries, Evenm Hawazen aka cowgirl humora knows Enderta is your master, even wedimedhin berad, besides Temben and Adwa, has hefy endertan roots, Endereta is ready to so'domize the entire cursed [deleted]'shienland. But mycowgirl [deleted] will always be mine.